At this site, Patriot militia commanded by Brigadier General John Butler ambushed loyalist militia commanded by Colonel David Fanning in an effort to free prisoners, whom the Loyalist had captured at Hillsborough the previous day. Although losses were heavy on both sides, the Loyalist kept their prisoners and continued their march to join the British forces at Wilmington. After the four hour battle, local residents cared for the wounded on both sides and buried the dead. Location. 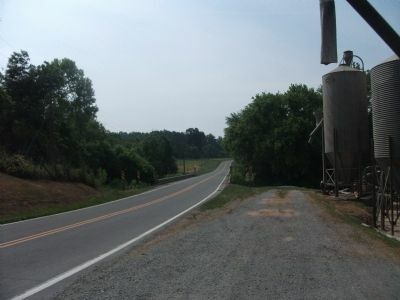 35° 53.343′ N, 79° 20.596′ W. Marker is in Snow Camp, North Carolina, in Alamance County. Marker can be reached from Lindley Mill Road. Touch for map. Marker is at or near this postal address: 7763 Lindley Mill Road, Snow Camp NC 27349, United States of America. Touch for directions. (approx. 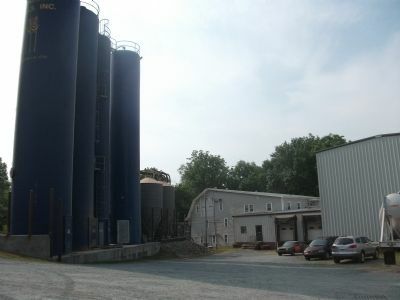 1.4 miles away); Lindley's Mill (approx. 2.4 miles away); Uncle Eli's Quilting Party (approx. 2.7 miles away); B. Everett Jordan (approx. 3.3 miles away). Touch for a list and map of all markers in Snow Camp. More about this marker. 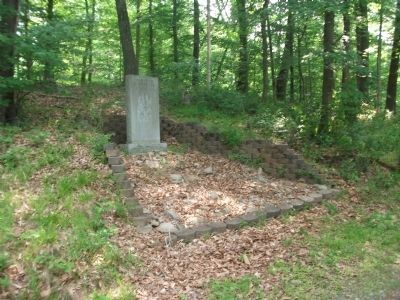 This marker is the second of three markers, down a trail on private property, across the road from Lindley's Mill. It is a short hike to the markers down a wide, wooded driveway that borders Cane Creek. The trail widens into a clearing and begins again on the other side. Insect repellant is recommended. Trail begins across the road from Lindley's Mill, down a driveway at the yellow and black caution signs, just before the bridge guardrail. A working flour mill. Flour is available in 25 pound bags. More. 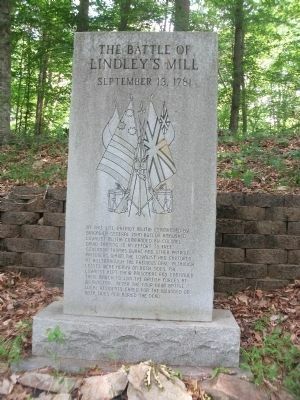 Search the internet for The Battle of Lindley's Mill. Credits. This page was last revised on June 16, 2016. This page originally submitted on May 14, 2010, by Paul Jordan of Burlington, N. C., U. S. A.. This page has been viewed 1,717 times since then and 21 times this year. Photos: 1, 2, 3, 4. submitted on May 14, 2010, by Paul Jordan of Burlington, N. C., U. S. A.. • Kevin W. was the editor who published this page.